I am so relieved that Spring has finally sprung. We got off to a shaky start here in Victoria, as the weather decided to tease us with a glimpse of sunshine before dissolving into rain. But last weekend it felt like Spring at last. 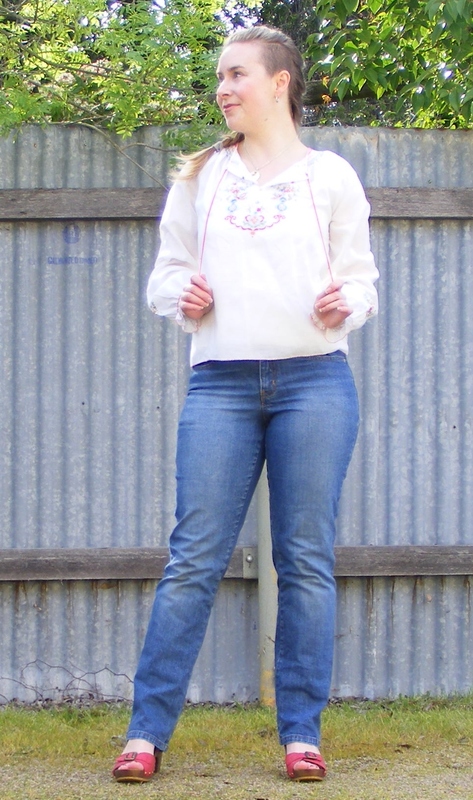 And I was extra pleased because it was warm enough to wear this new peasant blouse I got from the op shop a month ago.  I’ve shaved my head a couple more times since my last blog post. My hair was growing very fast so I decided to splash out and invest in a pair of clippers so that I could maintain my shaved side at home. It was a very smart choice. Although it’s been a bit nerve-wracking wielding the clippers myself, I’m much happier with the result. I’ve been taking my hair all the way back to a bristling number 1 cut, and then letting it grow out a bit. The detailing on this blouse is just so pretty. 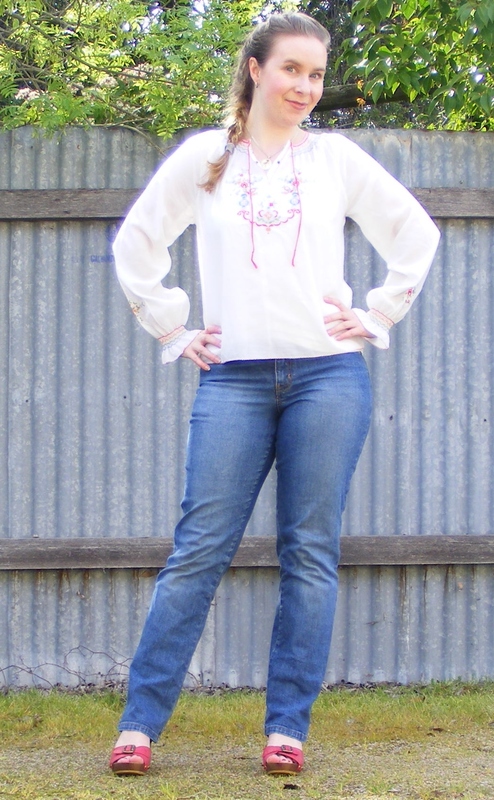 I’ve been after an embroidered peasant blouse like this one for ages, but most of the ones I found were either badly stained or had a gathered waistline. As I have wide hips and shoulders and a small waist, blousy tops that are fitted around the hips look terrible on me. But this one hangs in a lovely way and I adore it. I picked it up for $3 at my local St Vinnies. 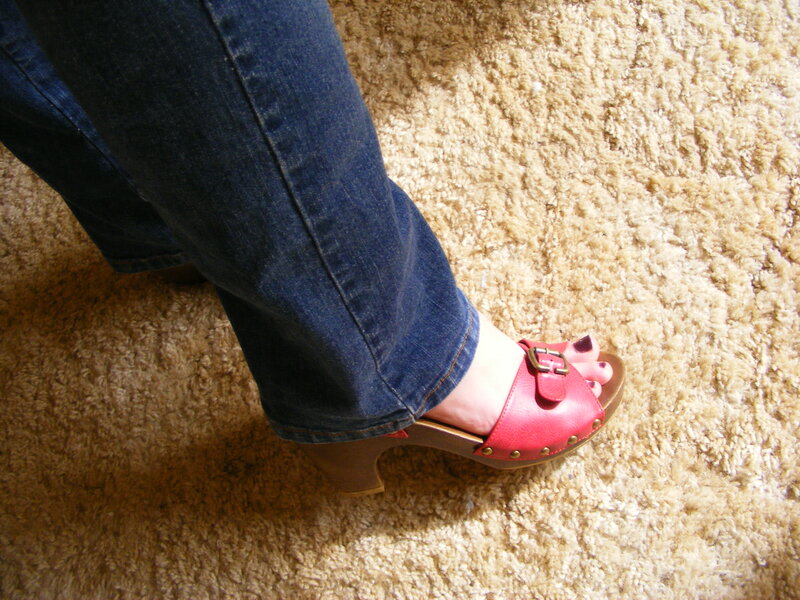 These red clogs are another new thrift store find. They were just $4 and had never been worn. They will go so nicely with many of my summer dresses and skirts and look great with jeans. I wore this outfit to go out for a bit more op shopping and then treated myself to coffee and cake at one of my favourite cafes. It felt like the perfect outfit to celebrate the beginning of the new season. Previous What’s going on around here? Next A geek’s guide to online dating: your profile picture. Suuuper cute outfit! 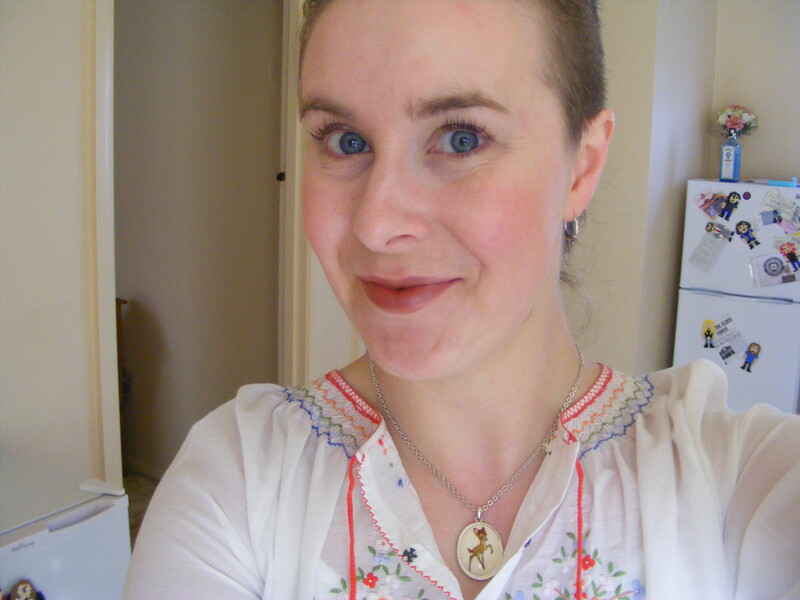 I feel like I need to go op shopping with you one day, the op shop fairy seems to smile on you often! 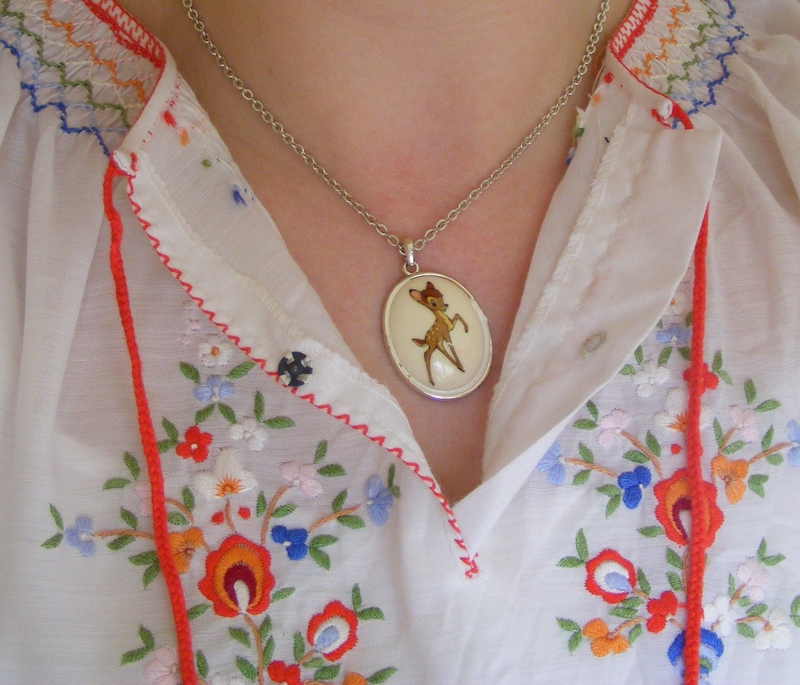 Also, that bambi necklace is adorable! YES! You need to come op shopping with me. I would love to spread some of my op-shopping luck around. Great outfit! I have such a perpetual love for peasant blouses. The vibrant embroidery on this one is particularly pretty. Thank you sweetheart. I’ve wanted a blouse just like this for so long, but finding one the right size and cut has proved more difficult than anticipated. A lot of peasant blouses are fitted at the waist and billow out, which just doesn’t suit my body shape. I wanted one that was looser in the body with no fitting around the hips, and this one fit the bill perfectly!